This is a medium circuit similar to our 1 Day Easy Biking Get Out of Town Explorer tour but with both on- and off-road sections, a few more hills, and a river crossing by boat into local villages. 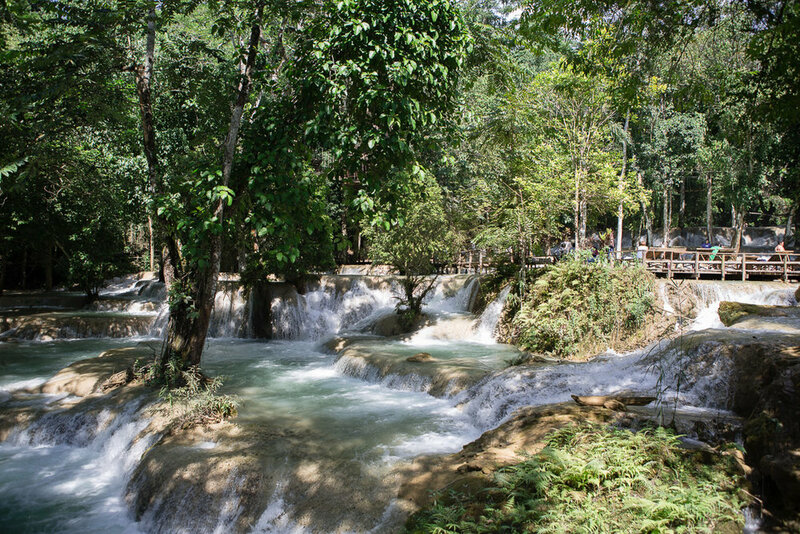 The tour will take you to explore famous paper and weaving villages; through rice paddies, jungle and mountain landscape; and to the Nam Khan River and Tad Sae Waterfall (seasonal). 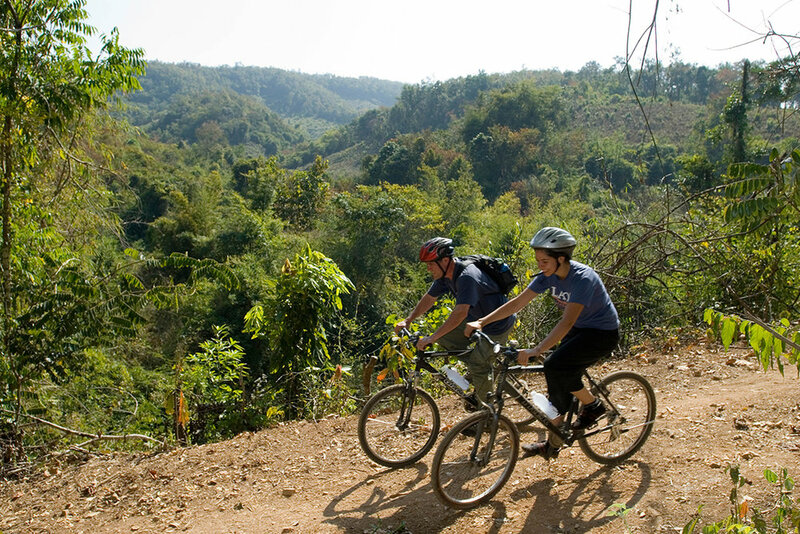 Enjoy a day of biking through the foothills of mountains surrounding Luang Prabang to see jungle, village life, nature, and waterfalls. Meet your guide early morning to get fitted on one of Tiger Trail’s quality mountain bikes. We’ll ride from the city center across the old communist bridge and into local villages along the Mekong River. Stop to explore the Ban Xieng Lek paper and weaving village. We’ll wind our way through the outskirts of the city and then off-road into beautiful countryside with rice paddies and simple agrarian villages. We’ll cross the river again, this time by local boat along with our bikes, then make our way to the Tiger Trail Adventure Camp terrace in the Nam Khan River valley. Take in the impressive view of jungle-covered Karst mountains. We’ll board one of our boats for a scenic ride upriver to the Tad Sae waterfall where we’ll have lunch and enjoy the beautiful area with time to swim and explore. There are elephants at the waterfall that you can watch and you're welcome to buy some bananas and sugarcane to feed and interact with them. We’ll return by boat to our bikes and cycle through beautiful scenery on our return ride by paved road to Luang Prabang city. Total biking is 46 km (29 mi) on mixed dirt and paved road with some hills. In the low water season, Tad Sae Waterfall is dry and will not be visited. Lunch and activities will be at our Tiger Trail Adventure Camp and we’ll take a boat ride and short jungle walk along with seeing a baby elephant (optional). For a similar circuit all on-road (great for the rainy season), check out our 1 Day Easy Biking Get Out of Town Explorer tour.